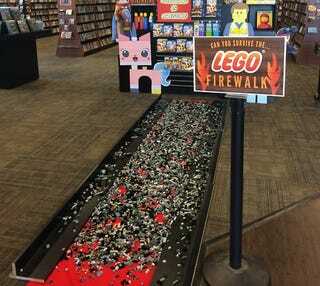 The Lego Firewalk has to be the most twisted, most diabolical, most cruel invention ever created by humankind. There's no way in heaven or hell that anybody can survive this walking barefoot without collapsing into a sobbing mass of trembling flesh, furthering the excruciating pain. If you want to try it, go to the Bull Moose music store in Mill Creek, Maine.